The DropTools Palette is a free LiveCode utility that lets you drag and drop custom controls directly to your stacks, automatically installing any necessary resources that it may require to operate properly. A specially designed custom control stack is called a "DropTool"; DropTool stack developers can choose to add built in "about" information, or even a custom "inspector" to manipulate the control once it has been dropped onto a stack. This control is a wrapper around a Data Grid that uses the native scroller on iOS and a scripted momentum scroller on Android. A simple password field that you can add to your stacks. A simple but useful control that lets you set up a color swatch that brings up a color picker and displays/stores the color you pick. This control mimics the behavior of the iCal calendar from OS X Snow Leopard. 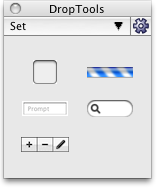 This control mimics the behavior of popovers in OS X Lion. Numeric field with a spinner control that's customizable and easy to use. It takes very little effort to turn a control you have into a DropTool... in fact depending on how it works, it can be as simple as putting it on a stack and setting a few custom properties! © 2015 Sons of Thunder Software, Inc.